I'll be at the Global Dance Festival all day today at Red Rocks. Here's a link with info. I'm beyond excited to be in such a beautiful venue, listening to some amazing DJs like Wolfgang Gartner and Above and Beyond. It's going to be unreal! I had to do some bright nails, so I chose a gradient using two Color Clubs Jackie OH! (I think) and Almost Famous. I got a set of 7 colors from Ross, and they never come with names, so I may be wrong about Jackie OH!. That gorgeous black and white glitter mix on top is a new addition to the collection from Black Cat Lacquer called Static Age. I hope everyone has an awesome night! Keep up with my day's adventures on Instagram (follow blognailedit) if you're interested in what's going on! The colors you picked go together so well! This is very cute. Oh how fun! I love the colors you used for your mani! 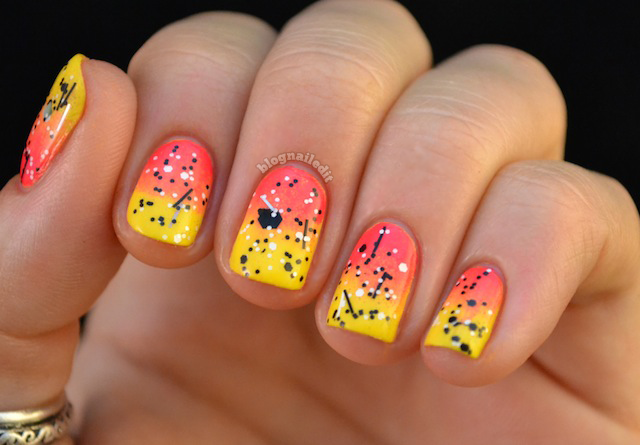 Amazing gradient! It's absolutely perfect for summer. These look amazing, I love the color combo. I absolutely love it! It's perfect for summer!